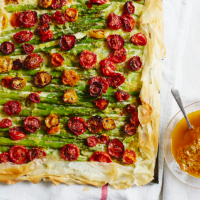 This delicious tart is a great way to make the most of the last of the year’s asparagus. I often make a double batch of the roasted tomato dressing – it’s great for spooning over roasted potatoes, spreading on toast or as a punchy salad dressing. 1. Preheat the oven to 150˚C, gas mark 1. Start by cutting the tomatoes in half and laying them cut-side up on a baking tray. Sprinkle with salt and pepper and 1 tbspolive oil and slow-roast for about 1½ hours, until soft, sweet and sticky. Meanwhile, sauté the leek in a frying pan with 1 tbsp oil for 20 minutes, until soft and sweet; set aside. 2. For the dressing, pound the rosemary and garlic to a rough paste using a pestle and mortar. Add a handful (about 50g) of the roasted tomatoes and pound until they start to break down. Add the mustard and vinegar; stir well to combine. Pour in the extra virgin olive oil, stirring. Taste and season; the dressing should be quite coarse and textured. 3. Bring a large pan of salted water to a vigorous boil. Snap the asparagus spears near the base – they will naturally break off where the fibrous part ends – and discard the ends. Drop the asparagus into the water and cook for 1½ minutes; they should still be firm but not crunchy to bite. Remove with tongs, put into a bowl and immediately season and dress with the remaining 1 tbsp oil. 4. Mix the eggs, crème fraîche, mustard, lemon zest and sautéed leek with a good pinch of salt and pepper; set aside. 5. Preheat the oven to 200˚C, gas mark 6. Grease a baking tray (about 26cm x 36cm) with olive oil. Layer the filo into the tray, brushing with a little oil between each sheet, leaving a 3-4cm overhang (you will fold this up later to make the edge). 6. Once the filo shell is ready, scatter in the asparagus, then pour over the leek and crème fraîche mixture. Scatter over the remaining roasted tomatoes. Scrunch the overhanging filo into a scruffy, frilly edge, then brush with a little more oil. 7. Bake the tart on the bottom shelf of the oven for 20-25 minutes, until the pastry is crisp and lightly golden and the filling is just set. Serve warm, with the tomato dressing spooned over the top. This recipe was first published in Mon Jun 01 14:50:56 BST 2015.